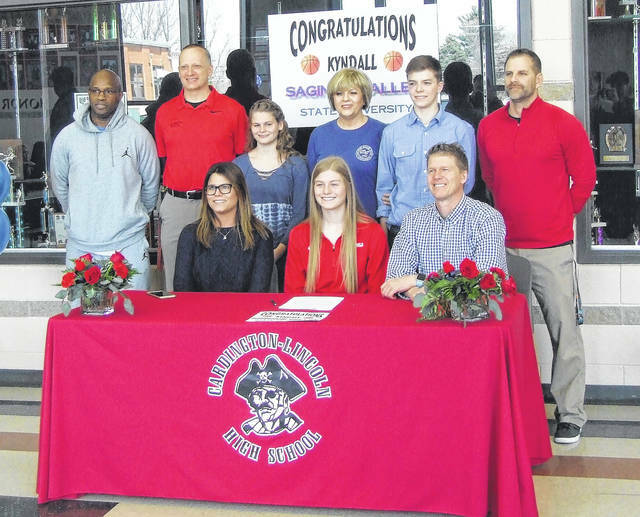 Cardington senior Kyndall Spires (front row, center) is pictured with her family and coaches as she signed to play basketball for Saginaw Valley State University. In the front row with Spires are her parents, Crystal and Dan. In the back row are (l-r): AAU coach Willie Jordan, Cardington assistant coach Scott Hardwick, Alexis Miller-Spires, grandmother Deborah Wells, Cayman Spires and Cardington head coach Jamie Edwards. After a successful senior season for the Cardington girls’ basketball program that included being picked to the first team All-KMAC squad, as well as being a third-team Central District selection, Cardington’s Kyndall Spires is making plans to continue her basketball career at Saginaw Valley State University in Michigan. Spires noted that she liked a number of things about the Division II school that competes in the Great Lakes Intercollegiate Athletic Conference. As her high school coach, Jamie Edwards, said before the signing, Spires didn’t immediately become a prospect the second she stepped onto the court as a youth, as it took a lot of work, as well as gaining some height, to get to that point. The end result was a lengthy recruiting process, as many schools were looking to get her to join their programs before she picked Saginaw Valley State. She mentioned several others she was considering, including Mount Vernon Nazarene, Mount Union, Baldwin-Wallace and Lawrence Tech (Michigan). For Spires, who plans to major in psychology, being able to play basketball in college seems like a reward for all the work she’s put into her game throughout the years. She noted that the sport has been a year-long pursuit for some time, oftentimes taking priority over everything else. When it comes to her upcoming college career, Spires is looking forward to winning after a high school career that saw her teams win a total of 79 games over four years, making it as far as the district finals — leaving her with many good memories.